How many times, as a boat owner, have you stood and puzzled over a technical dilemma? HOW many times, as a boat owner, have you stood and puzzled over a technical dilemma? It doesn’t matter whether it’s a problem with the main engine’s starter motor, a leaking window seal, water in the fuel tank or a blocked diesel injector – it’s virtually guaranteed that something will leap up and bite you when you least expect it. And that can cost you non-trivial sums of money and, more importantly, many hours to sort out – hours that would have been far more enjoyably spent out on the water than back in the yard trying to solve the puzzle. When that kind of thing happens, I just know I’m going to end up undoing the wrong connector or filling the bilges with half the contents of my fuel tank. But this new tome is designed to show you, in simply step-by-step format, just how the average boat owner can address most of the day-to-day problems that are likely to occur. 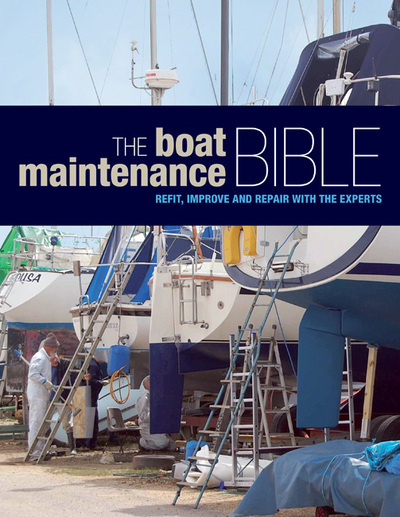 Starting with an appraisal of the kind of tools you’re likely to need, the Maintenance Bible runs through an impressive list of activities ranging from care of ropes, canvas and upholstery through care and maintenance of the hull and fittings, painting and varnishing, water gas and electrical systems, fitting instruments, battery maintenance and the like. But it also goes into straightforward advice on engine maintenance and simple servicing (both inboard and outboard motors) and laying up for the winter. In short, it covers virtually everything you need to know to keep your boat in the water and ready to use. I remember fondly the famous old Readers’ Digest Do It Yourself manual first published in the 1960s – I’ve still got one in the bookcase at home. And the Boat Maintenance Bible follows a similar pattern. It offers step-by-step advice with excellent illustrations (in this case a picture really is worth a thousand words) that will lead you through each process. It’s a terrific manual and well worth the £29.99 asking price (although you can probably find it cheaper at Amazon). The ISBN number is 978-1-4081-2479-6. I WAS delighted this week to hear from Barry Baldwin who read last week’s Riverwatch about the public landing on the Thorpe bank of the river just upstream from Truss’s Island. You may recall that Bernard Hales from the River Users’ Group was trying to prove that such a landing – and the public right of way that allowed people to access Chertsey Lane from it – was recently in use. Barry read the article and contacted me to say that he used it every day, six days a week until around 2000 because he lives in Penton Park and used to row across the river from the Thorpe landing to the Wheatsheaf Lane steps to open up the butcher’s shop he used to run there. He told me: “I used to cycle from home to the landing where I kept my boat, load the bike into the dinghy and row across the river, tie the boat up and then cycle to work. Thanks for that, Barry, I’ve passed your comments on to Bernard Hales and hopefully, the RUG folk can reopen discussions on this issue.